This charming hotel can be found in Chester. A total of 40 units are available for guests' convenience at Gateway to Wales Hotel. All kinds of guests will keep updated thanks to the Internet connection available at Gateway to Wales Hotel. Gateway to Wales Hotel offers a 24-hour reception service, so that guests' needs will be fully met at any time of the day or night. This property does not offer cots on demand. Communal areas are wheelchair accessible at Gateway to Wales Hotel. The accommodation accepts only small pets. Gateway to Wales Hotel provides parking for guests' convenience. There are business facilities and services for guests' added convenience. Some services may be payable. 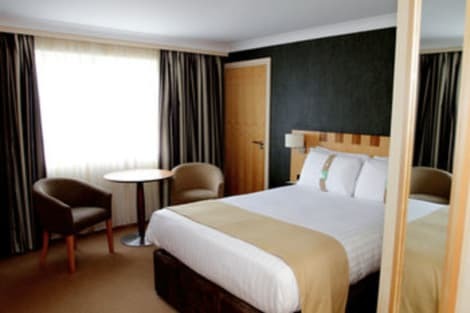 A modern North Wales hotel close to Chester, with a restaurant and facilities for meetings and weddings Holiday Inn® A55 Chester West hotel is in the beautiful Welsh countryside, close to the border and a 15-minute drive from Chester. A park-and-ride scheme provides hassle-free access to the city. The hotel is close to the A55, which provides links to the region. The area is best explored by car, and there's ample free parking at the hotel. The Welsh coastline is dotted with castles. CADW castles and historic sites are all within 30 minutes' drive from the hotel. Hunt for designer bargains at Cheshire Oaks Outlet, 20 minutes away by car, or head to Chester, where you can discover history at Chester Cathedral, see the ancient city walls or spend a family day out at Chester Zoo. Business travelers visit the area for Deeside Industrial Park and St. Asaph Business Park, 10 and 25 minutes away respectively. You can hold a conference at one of the hotel's four meeting rooms. The largest, the Vivaldi Suite, opens on to a landscaped garden, making it an ideal venue for weddings, too. Kids stay and eat free, so book a family room with two double beds and make the most of dining at the hotel's Conservatory Restaurant. Work out at the mini-gym, and stay connected with free Wi-Fi. End the day unwinding with a drink in the bar. lastminute.com has a fantastic range of hotels in Deeside, with everything from cheap hotels to luxurious five star accommodation available. We like to live up to our last minute name so remember you can book any one of our excellent Deeside hotels up until midnight and stay the same night.